Europe claimed their sixth straight home Ryder Cup victory Sunday at Le Golf National in France, defeating the U.S. 17 1/2 – 10 1/2 across five sessions. The U.S. started out strong Friday morning, winning three of the first four matches, but Europe rallied back with seven straight victories. Europe regained the Ryder Cup after losing two years ago at Hazeltine National. 1. 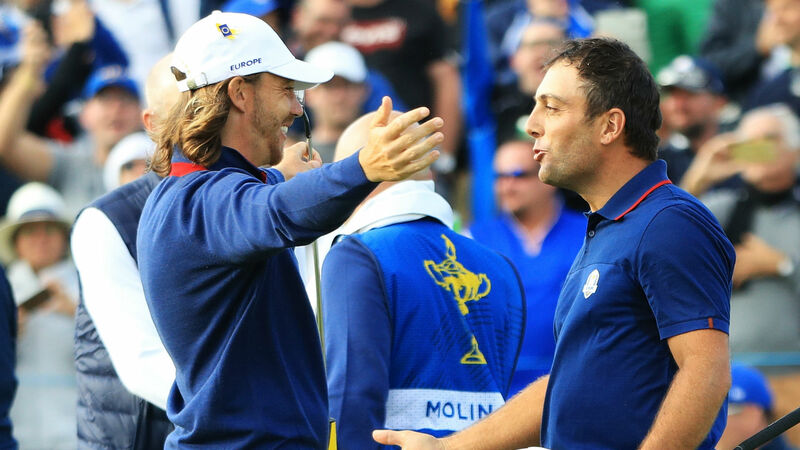 Francesco Molinari makes history; Henrik Stenson emerges as quiet European leader — With an 4 and 2 victory over Phil Mickelson during Sunday’s singles matches, Molinari became the first player ever to win a major championship and go 5-0 at the Ryder Cup in the same year. Molinari, an excellent ball-striker and putter, went 4-0 with Tommy Fleetwood as his partner and then capped off the week with a win over Mickelson, the most experienced player on the U.S. squad. Molinari, ranked fifth in the world, outdueled Tiger Woods and Rory McIlroy to win the Open Championship this summer, which was part of a stretch of three wins and two runners-up finishes in six events. He is now a worldwide star. Stenson seemed like an afterthought entering the Ryder Cup. Having dealt with injuries throughout most of the last two seasons, the stoic Swede no longer seemed like the leader he was in 2016. But Stenson still had a few tricks up his sleeve in France, finishing the week 3-0, twice winning with Justin Rose in foursomes, and also dispatching Bubba Watson, 5 and 4. Stenson should go down as one of the all-time Ryder Cup greats. 2. Jordan Spieth starting to lose U.S. darling title — After finishing the PGA Tour season without a top-2 finish and failing to even qualify for the Tour Championship, Spieth ended the Ryder Cup with yet another singles loss. Spieth fell a whopping 5 and 4 to Denmark’s Thorbjorn Olesen, a Ryder Cup rookie who had not played since Friday morning fourballs. Spieth lost six of the first nine holes in the match, falling to 0-6 lifetime in Ryder Cup and Presidents Cup singles matches. Spieth became America’s darling, a possible successor to Woods after a huge year in 2015. But since, Spieth has looked a bit forlorn walking down fairways, mumbling and complaining when things don’t go his way. It was surprising to see Spieth play all five sessions this week, though he did win three matches alongside Justin Thomas. If Spieth, now ranked 10th in the world, is to regain his position among the game’s elite and recapture the hearts of American golf fans, he needs buckle down and take responsibility of performances. 3. Tiger Woods fails to impress; Patrick Reed completely mismanaged — What a difference a week makes. Last Sunday, the world was enamored by Woods’ victory at East Lake, his first in five years while also almost claiming the FedEx Cup in the process. But one week later, Woods was left on the 17th green shaking hands with Jon Rahm after losing his Ryder Cup singles match 2 and 1 to finish the week 0-4. Woods has never been any good at the Ryder Cup, often even looking disinterested. But Woods’ years of injuries had left him feeling the team spirit a little more, so there was hope he would play well. Woods looked a bit listless this week, only showing a couple glimpses of emotion. At 42 years old, he will have to seriously consider if he ever wants to play this tournament again. A lot of things went wrong for U.S. and captain Jim Furyk this week, but nothing was as head-scratching as the total misuse of Reed. Deemed “Captain America” in 2016 after going toe-to-toe with Justin Rose, Henrik Stenson and Rory McIlroy, Reed looked like the emotional leader the U.S. needed in this competition. But he was a ghost this week until beating Tyrrell Hatton 3&2 in Sunday singles. But even hiding Reed and putting him up against Hatton seemed odd. Reed should have never been paired twice with Woods. It just diminished his value. Furyk will look back and wonder what went wrong. He shouldn’t have to look any further than his mishandling of Reed.